On damp, raw January days when the wind slices through the thickest clothing, body and soul cry out for comfort food. Seasonal craving for warmth and substance may be at odds with new year diet resolutions, but sometimes you have no choice but to succumb in the knowledge that such a lapse is easily forgiven and will do wonders for one's wellbeing. The Elm Tree at Langton Herring near Weymouth has long held a reputation for cosy dining and excellent food, and the lunchtime I popped in with a friend did nothing to dim its good name. The weather was resolutely cold, grey and drab, so we settled in to a cosy nook between the bar and a warming log fire and perused the menu and chalkboard with anticipation. There was much 'umming', 'aahhing' and changes of mind before our final decision was reached. I opted to start with deep-fried squid on a bed of salad, while Mim went for fresh grilled sardines. The squid was perfect, nothing like the chewy morsels that often masquerade under the same name in traditional pub cuisine. The small rings and tendrils of seafood were deliciously tender and served on a fresh bed of watercress and salad leaves, decorated with pieces of cherry tomatoes. The sardines also made a lovely start to the meal. They were fresh and tasty, dusted with piquant Cajun spices and served with salad. If there was any complaint about the starters it was of the 'not sure I’ve got any room left for my main course' variety. But when the mains arrived they over-rode any doubt. The sea bream was beautifully presented on a bed of Mediterranean vegetables and was served with a colourful creamy sauce. The meat was firm and flavoursome, day-fresh and excellent value for money. The coq au vin was part of the Elm Tree’s £5 Winter Warmer selection, which also included chilli, vegetarian lasagne and game pie. 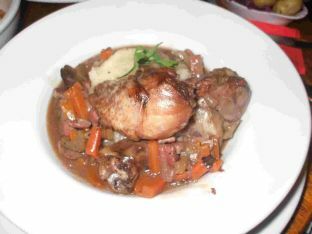 It was two large, succulent and meaty chicken drumsticks – the meat fell off the bone – on a bed of fluffy mashed potato served in a bowl with a gorgeously thick and tasty gravy (the au vin very much in evidence) that contained mushrooms and carrots. Perfect winter fodder, the main courses came with a bowl of perfectly cooked mixed vegetables and we also ordered a bowl of the most wonderfully crisp and golden chips, just to be on the safe side. * The Elm Tree Inn, Shop Lane, Langton Herring, Weymouth, Dorset, DT3 4HU, 01305 871257. Opening hours: Monday to Saturday 11.30am to 3pm, and 6pm to 11pm, and Sunday noon to 3.30pm, and 7pm to 10.30pm.